Sales, installation and servicing the Surf Coast, Wye River, Aireys Inlet, Lorne, Anglesea, Torquay, Moriac, Bellbrae, Geelong and outer regions. 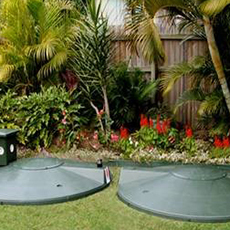 Aqua Nova Septic Treatment System: an effective environmentally friendly, sustainable, septic wastewater recycling process. How does the Aqua Nova Aerated Treatment System work for you? Aqua Nova is a two tank system which provides the very latest in aerated wastewater treatment through a multi staged digestion process using naturally occurring bacteria and enzymes. In the primary stage, treatment is anaerobic, where bacteria thrive in an oxygen free zone, and the breakdown of solid waste is performed. From here the waste is sent to the second stage where air is continually supplied to bacteria providing aerobic treatment to complete the total digestion process. At this point the wastewater passes through a clarifying process into the disinfection chamber where any remaining pathogenic bacteria are destroyed. Finally the now clean, clear and disinfected water is delivered by an integral submersible pump with automatic level control to a selected irrigation system in landscaped garden beds or other dispersion areas.